The Portuguese culinary tradition is all about simple, delicious meals enjoyed with friends and family. Most Portuguese families gather together around the kitchen table every Sunday. Behind any Portuguese dish, there’s the recipe of a mother, an aunt and a grandmother. This is one of the reasons Portuguese food is so special. It’s full of wholesome, loving flavor. And with so much tradition and culture, how do you define the best national dish of Portugal? Tripas à moda do Porto is said to have originated in the 14th century, when the Castilians laid siege to Lisbon and blockaded the Tagus River entrance. Starvation spread all over Lisbon as food prices rose astronomically. The story goes that the citizens of Porto organized a supply fleet that managed to slip through the river blockade. And since all available meat was sent to Lisbon, Porto residents were limited to only the offal and organs, like tripe. Another account of the origin is that in 1415 Porto sent all its meat on the expedition that conquered the city of Ceuta in North Africa. Every part of the animal was taken except for the tripe, which was left behind because of its more perishable nature. Whatever the truth may be, people from Porto have historically been known as tripeiros or tripe eaters. It’s impossible to say what is The Best National Dish of Portugal. So, in this article we have cast a wider net for those with differing tastes. There is a lot here for Meat and Fish people, but also a little something for the Vegetarians. Portuguese cuisine varies tremendously from region to region. As such, we have featured dishes from across the country. Finally we’ve included information on the best seasons for each dish, so you can coordinate your meal choice with the most appropriate season. Staples of a Portuguese kitchen table include bread, olives, cheese, red wine and vinho verde, fresh vegetables and rich meats. Ingredients that feature heavily in Portuguese cuisine are olive oil (a national specialty), garlic, onion, parsley, bay leaves and SALT. Salt flats operate in Aveiro and the Algarve where you can find salt harvesting and traditional salt houses. Portuguese cuisine is typified by simple yet strong flavors. A lot of garlic, a lot of salt, a lot of sugar. But always fresh, and prepared thoughtfully. 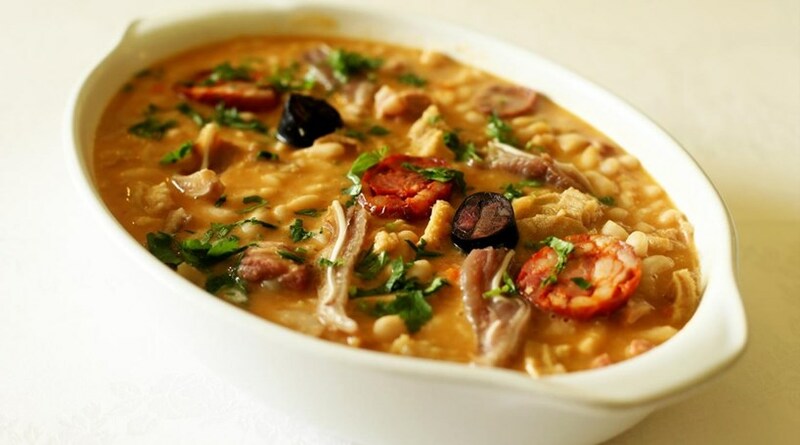 Traditional Portuguese food tends to be rich and hearty. To this day in rural areas, families raise their own cattle and kill animals to make the most out of every single piece of meat. A Francesinha for your hangover! Francesinha, literally translated to little French girl, is a Portuguese dish originally from Porto but a stones throw from the French croque-monsieur. It’s basically a meat sandwich, covered in cheese, sitting in tomato soup. A classic Francesinha is made with bread, ham, smoke cured pork sausage, fresh sausage like chipolata, steak or roast meat, and covered with melted cheese and a hot thick tomato and beer sauce. There’s usually an (recommended) option to have a fried egg on top and it is typically served with french fries. A great post surfing option, any time of the year. A good Francesinha is all about the quality of the meat, and the sauce. The sauce recipe varies from restaurant to restaurant, the only common ingredient being beer. Surprise, surprise, Francesinhas are best served with a draft beer. There are many restaurants in Porto who feature their Francesinhas. 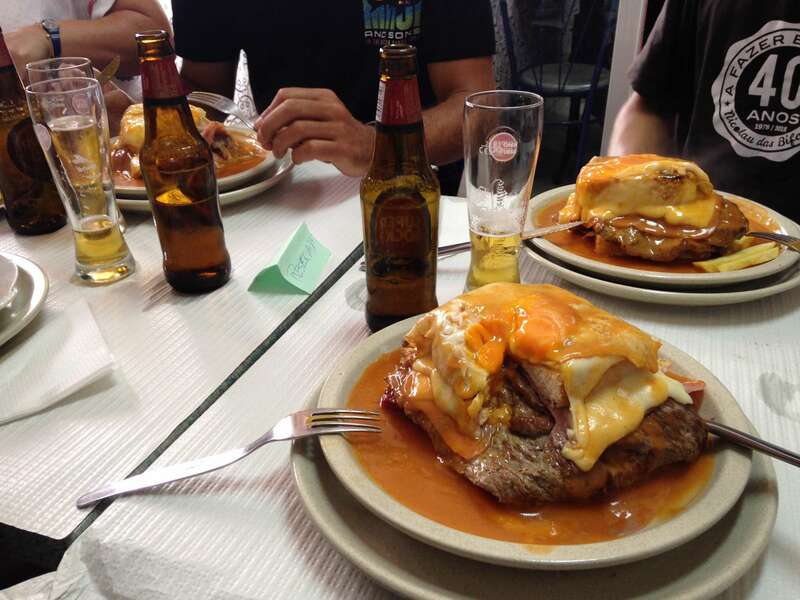 Most locals say the best place to get a Francesinha in Porto is Cafe Santiago. We’ve already described the history of the another famous dish of Portugal, Tripas à moda do Porto. This rich meat dish is made of tripe, beans and sausage. But while it is a common dish in traditional restaurants in Porto, and with Portuguese Mothers and Grandmothers, it is becoming less popular among the rising generations. So try some while you still can. Cozida á Portuguesa is a meat smorgasbord. Sitting in a restaurant, you can smell it from two tables away. 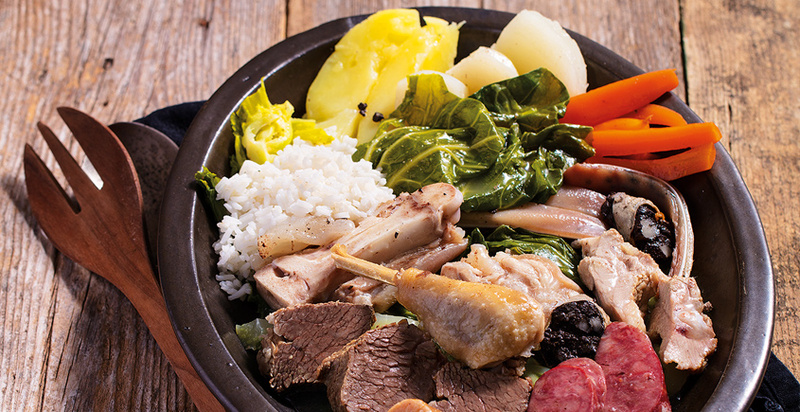 Depending on the chef, this dish can feature beef, pork, salt pork, chorizo, blood sausage, smoke cured pork sausage, pig’s feet, presunto, potatoes, carrots, turnips, chickpeas, cabbage and/or rice. Surprisingly you’ll find many Portuguese enjoying a lavish lunchtime portion of Cozido á Portuguesa with wine, and of course coffee. Portugal is a seafaring nation with a well established fishing industry. This is reflected in the amount of fish and seafood eaten. Portugal has Europe’s highest fish consumption per head. The most famous Portuguese fish dish is Bacalhau (salted cod), which is served on Christmas and other holidays and family gatherings. You are likely to find an option on the menu in any traditional Portuguese restaurant. But we are going to be a little harsh here, with apologies to our Portuguese friends and grandmothers… Bacalhau is not that good. It can be wonderful, and if anyone can do it the Portuguese can! But generally speaking cod is a fairly flavorless fish with a dull texture. Sustainability issues aside, we think we are doing a major disservice to all the other incredible fruits of the Portuguese ocean by featuring Bacalhau. So try it if you must but don’t feel guilty if you decide to get with the times and skip it altogether. And if you must try it, a good traditional option is Bacalhau a Bras, popular any time of year in the South of Portugal. You should 100% try fresh Sardines. The best season to have Sardines is May – October, but particularly June, July and August when they are big and juicy. Sardine season aligns with the amazing Portuguese summer. And the best way to have Sardines, if you dare, is straight off the street grills, Sardinhas Assadas. Any summer street party or backyard BBQ will feature Sardinhas Assadas. 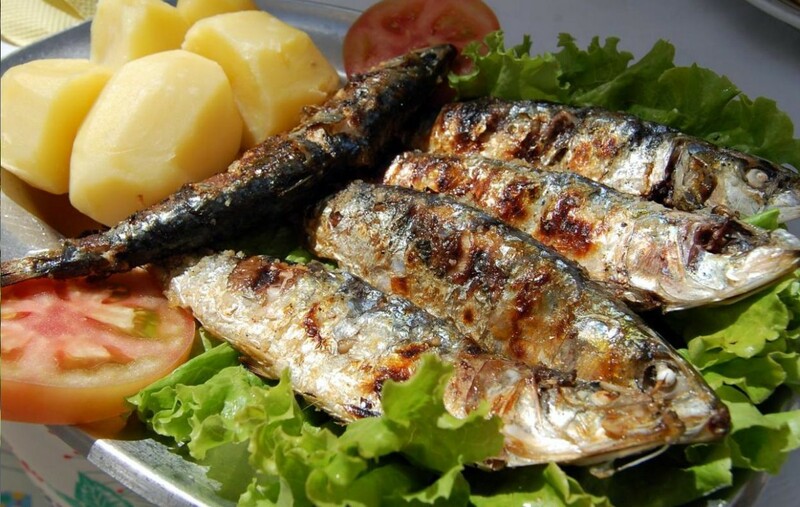 But if you aren’t feeling so bold, most traditional Portuguese restaurants will also have Sardinhas Assadas served with a side of boiled potatoes and vegetables. If you’re in the city of Lisbon during the month of June, you will get the chance to experience the the amazing Popular Saint celebrations. And a main feature of the festivities is street sardines served on a slice of bread. The bread is crucial because all the flavorful juices of the grilled sardine soak into the bread. All across Portugal, everyone eats sardines in June! Polvo, YUMMO! Polvo à lagareiro is a classic and delicious Portuguese seafood dish of boiled and baked octopus with smashed potatoes, all heavily doused in a herb and garlic extra virgin olive oil. Polvo à lagareiro is common throughout the country, but best enjoyed by the sea. Cataplana is a great example of the Algarve’s culinary history. The origin of the cataplana is inextricably linked to the presence of Arabs from North Africa in the Algarve many centuries ago. This seafood stew is named after the special copper pot in which it is prepared. There are many versions of the cataplana in the Algarve. A particularly delicious recipe includes monkfish, prawns, clams, Portuguese chouriço sausage and lots of fresh, bright vegetables. Cataplana can also be made with octopus, cod or even meat added to the clams and prawns. It’s ideally served with a good white or green wine, vinho verde. As a recent convert to vegetarianism, after one too many Francesinha hangovers, I am on the hunt for the best Portugal has to offer for vegetarians. And although you can find excellent produce at local markets, the Portuguese have yet to impress me with their vegetarian flair. As such, you vegetarians should check your expectations, but check back in a few years. The Portuguese are slowly adapting to a more vegetarian angle and I’m sure have something spectacular up their sleeves. The great news is that there is bound to be a municipal market in every sizeable town. There you can buy the freshest local and seasonal produce as well as Portuguese goods like honey, nuts and olive oil. In Portugal eating good quality fresh bread is part of every meal. As such, you’ll never find yourself far away from an authentic local bakery. 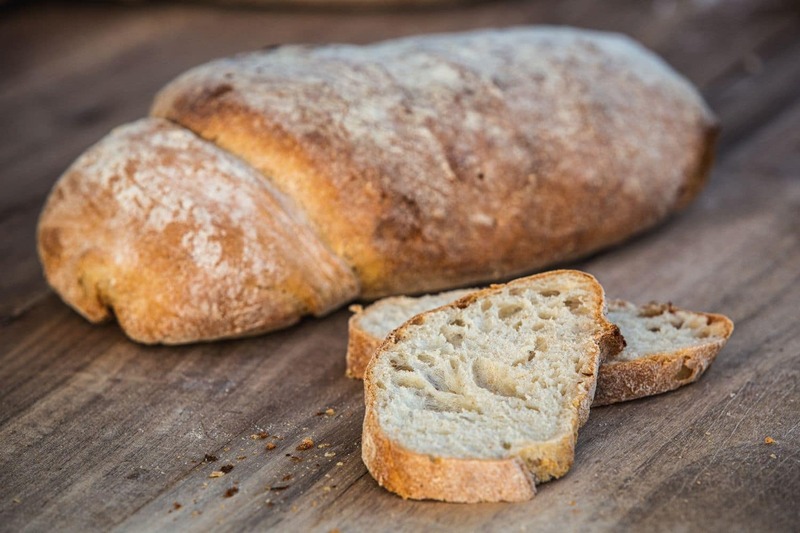 Made with three main cereals, corn, rye and wheat, Portuguese bread is different from region to region in form, color, taste and texture. Broa de Minho is a hearty bread made from corn with origins in the centre north of the country. These days it has spread to all of mainland Portugal. A large loaf has a very hard, cracked crust. Inside this bread is dense, moist, and slightly sweet like corn bread. The crunchy crust, and the fluffy and white interior, makes this bread one of the most popular and versatile in Portugal. It’s made using a lot of water, wheat and a little rye. 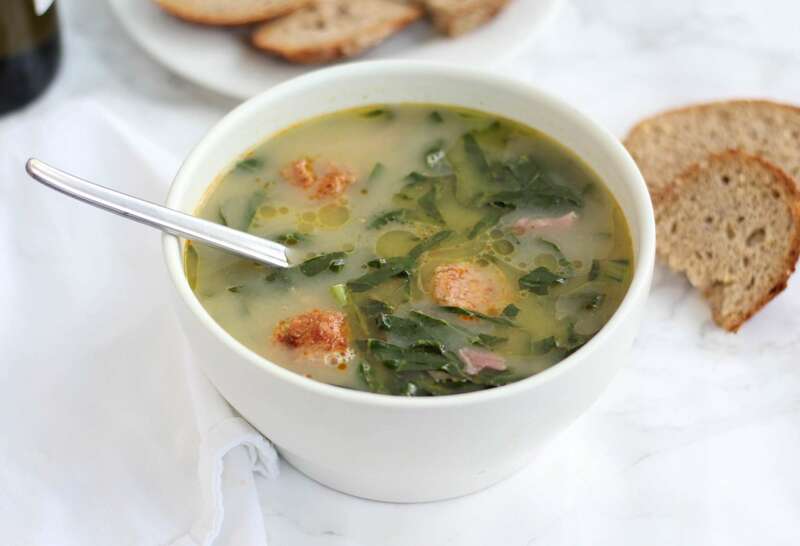 Caldo Verde is a kale and potato soup, traditionally served with chouriço. But you can ask them to hold the chorizo to make this lovely and warming soup vegetarian. You can find it all year round, in all parts of Portugal. 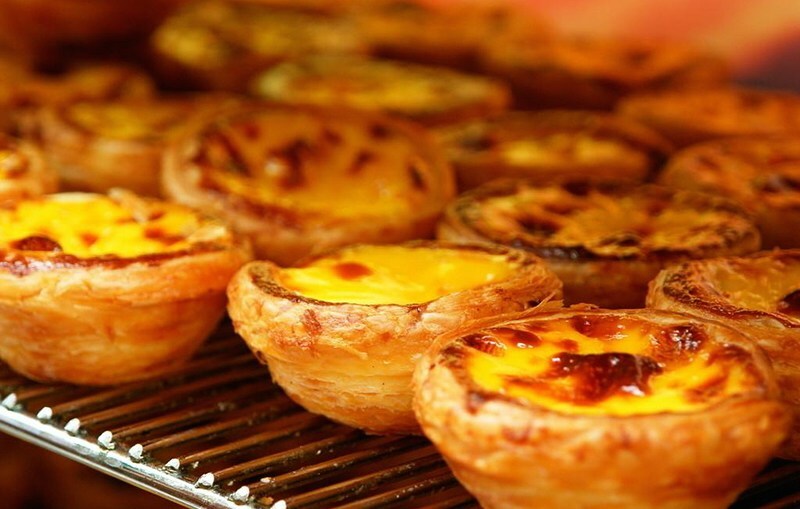 Pastel de nata is definitely the most popular and most famous Portuguese dessert. You can find pasteis de nata in any bakery or coffee shop in Portugal. 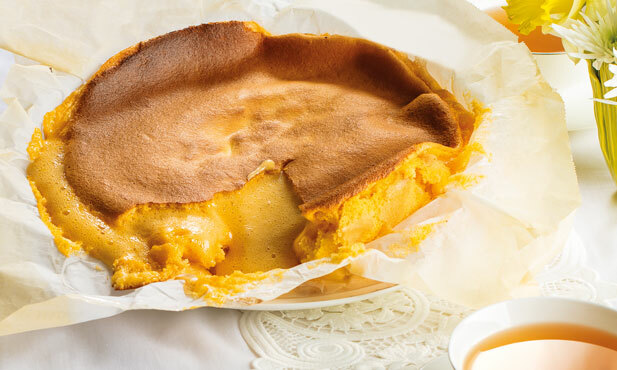 These ‘Portuguese Tarts’ are also found in Portuguese communities around the world. Pastel de nata is egg custard in filo dough, served with cinnamon. If you can get them warm, fresh out of the oven, it’s your lucky day. Although the ingredients are always the same, different bakeries will have slightly different styles. Don’t be afraid to have a Nata daily while in Portugal. The most famous place to get this tasty dessert while in Portugal is in Antiga Confeitaria de Belém bakery in Belem, Lisbon. This bakery is really popular among both tourists and locals. Pão de Ló has many variations: Pão de Ló de Ovar (our favorite), Pão de Ló de Alfeizerão, Pão de Ló de Margaride… The only difference between varieties are in the quantity of ingredients (eggs, sugar, and sometimes flour) and the time it stays in the oven. It’s a sort of crossroads between sponge cake and raw cake batter. Dozens of eggs and lots of sugar, and very moreish. Pão de Ló is typically served for Christmas and Easter. This sweet delight dates from the end of the Middle Ages when nuns were in charge of its preparation in the convents around the country. It is said that in the fifteenth century, pão de lo was cooked in a bread oven with the door sealed with horse manure. It took no less than 24 egg yolks and 6 egg whites, beaten by hand until reaching a foamy and airy dough. Leave it to the Portuguese to make a dessert sausage. Don’t worry veggies, there’s no trace of meat in this desert. It’s delicious! 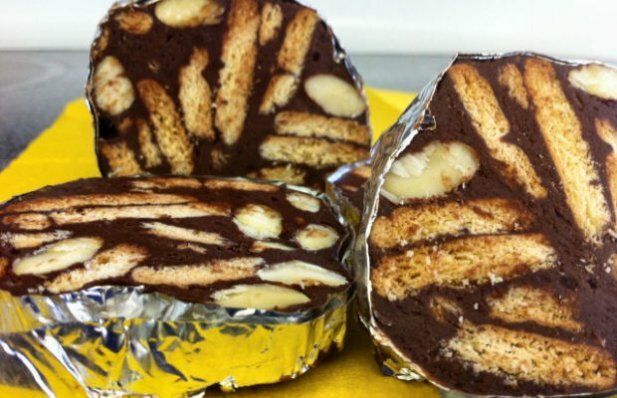 Made from dark chocolate, cookies, nuts, butter, eggs, and port wine and cut just like salami. A good option for the chocolate lovers among us.